This summer flowering bulb is native to the western U.S.. 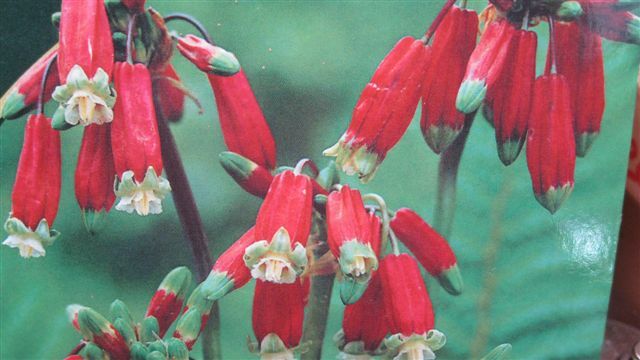 The stems grow to 20 inches tall with yellow and green tipped crimson tubular flowers in early summer. The leaves are narrow and strap like and the basal growth is frost hardy in a sunny location. Plant the bulbs now in well drained soil and sun. They need regular water until the flowers die, then keep dry. We will have potted and cut Holiday Trees in December. Just a couple of days left to get your pre-order bare-root fruit tree requests in if you are looking for a particular variety or large numbers of a single variety. You have till Nov 8 at the latest to get me your special order so that I can forward that on to Dave Wilson. Bareroot will be arriving at the end of January and we will have lots of choices in open stock for those of you who are not particual about a certain variety. 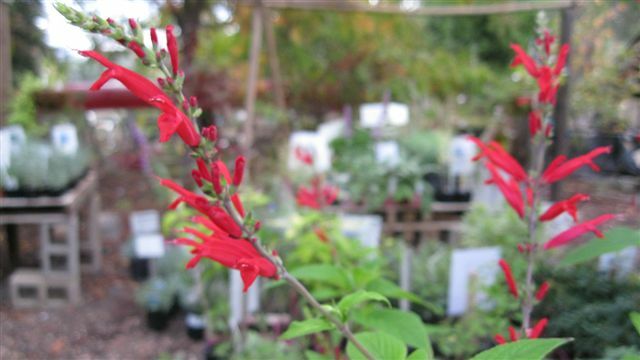 The nursery and surrounds are starting to color up for their autumn show. The Crape Myrtles, Chinese Pistache and Hawthorns look the best right now. 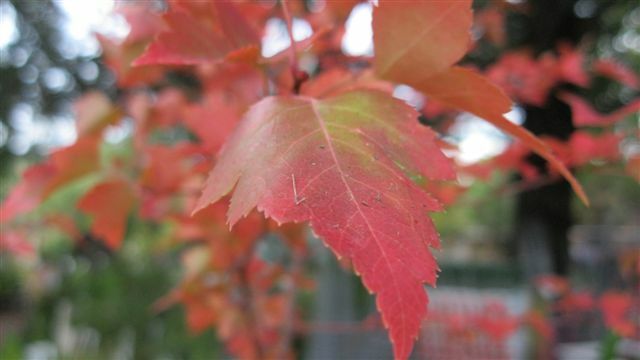 The Japanese and other maples have not begun, nor has our Raywood Ash. The lilacs are turning with more shrubs to follow. Some of the best for fall color are spirea, barberry, viburnum and hydrangea. The Boston Ivy is getting ready to color along with the grapes. A well planned landscape should have no shortage of spectacular foliage this time of year. November is a busy time in the garden. There is lots of clean-up, cutting back, dividing and preparing for winter cold along with bulbs and winter color to be planted, fruit trees and roses to be sprayed, and the winter vegetables to be fed. Now is the time to feed your fruit trees and spring blooming shrubs with 0-10-10 if they need an extra kick for bloom and disease resistance in the spring. Thanksgiving, New Years and Valentines Day are an easy reminder of dates to do your dormant spraying. We carry an all purpose Orchard spray or get copper spray for disease and combine with the oil spray for overwintering insects. 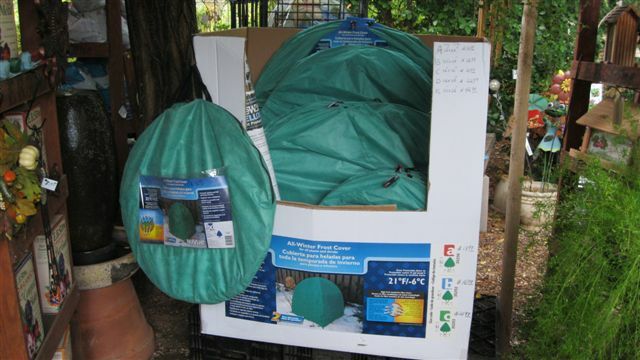 We have plenty of Cloud Cover and Wilt-Stop Frost Protection Spray along with Frost Cloth and Frost Covers including hanging basket covers because it is time to either cover your frost tender plants or bring them inside. Our first killing frost can be here any day now. I had a couple of 35 degree mornings at the nursery last week. Beautiful blooming Christmas Cactus are beginning to arrive for the holidays along with cyclamen. Now is the time to start forcing paperwhites for the Christmas holiday and we have amaryllis bulbs. These all make great inexpensive gifts for teachers and friends. Succulents and houseplants make wonderful gifts also. We are expecting to get some beautiful Rex Begonias in this week. Now that the rains have started it is time to sow wildflowers. Many of you passed on planting Ca Poppies and other great flowers last year. How about this year? We have several options for you to choose from including Renee’s Scatter Garden cans, Shirley Poppies, Lupine, Clarkia and perennial sweet peas. It is also time to adjust or turn off your irrigation system. If still left on reduce watering time. I usually have a later start time too so my drip hoses will be thawed out when the system comes on. Protect your valves from freezing if they are above ground and ‘bleed’ out the water if your system’s water supply is also shut off. Minnie Cannon is hosting a town Daffodil Planting Day on Nov 15 and is looking for volunteers to help. They have purchased thousands of bulbs and need people to help beautify the roads in the Middletown area. Call the school for details. Year end specials are here. 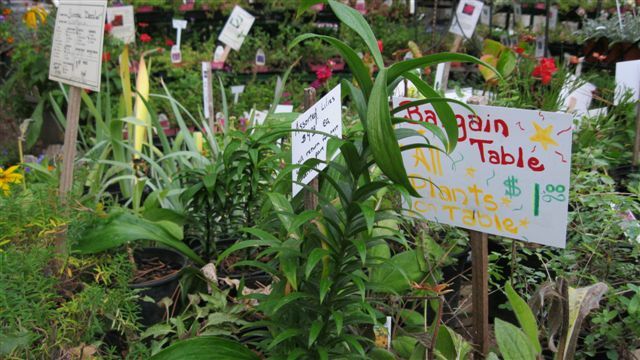 We have a bargain table where all plants are $1.00. Roses and deciduous shade and fruit trees are 30% off. We are again offering our traditional Nov sale of glazed pottery and all iron at 30% off.